Kitchen Reveal and some catching up! So I abandoned the blog for a bit, but the remodeling continues! Summer is here and I have three little kids underfoot (ahhhhh!). I am starting the deck this weekend because it is DESPERATELY needed. The sooner I can feed this herd outdoors and hose off the mess, the happier I will be. and I finally finished the odds and ends. This weekend I'm getting the 4x4's to start the deck. I'm going to ask for help digging all those holes for the posts :( In between endless trips to the pool and the lake, of course... happy summer to all the crafty women online! Y'all make me feel so normal. lol! Your kitchen looks phenomenal! All of your hard work has paid off. I am looking forward to seeing your island when it's installed as your place is perfect for it. I was wondering what amazing projects you were up to. I love the photos you posted of your kitchen - you must just love it every time you go in there (well especially when it is all clean like it is in the photo - haha). WOW! What a transformation! 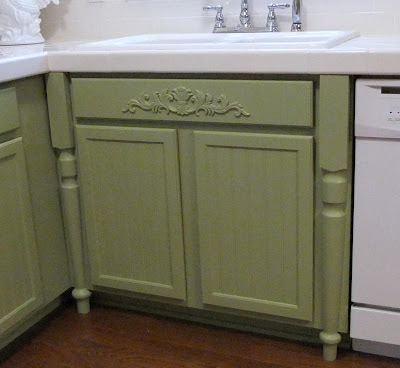 I love the extra detailing and spindles you put on the kitchen cabinets. I love the green!! GREAT JOB!! Looks like you replaced the countertop, too. What'dya use? i posted previously on the tiling tutorial, but I built the counters from scratch and tiled them with white ceramic tiles. The grout stains like heck and it's terrible, but it was cheapest option for white counters that are heat resistant.. So glad you posted! I follow your blog on my blog: www.lifeasmrswright.blogspot.com. The kitchen is INCREDIBLE!!! I need to show these picts. to Judd! By the way, I asked Judd about Tim's auger (sp?) and he said that Tim doesn't own one - just rents. So Sorry! Love the open shelving, so cute! Yay! I'm soo glad that you are back. I LOVE the kitchen. Great job! Enjoy your summer. Can't wait to see more! Love the garage and the kitchen... doesn't it feel good to be almost done? I definitely know where the main water shut off valve is. It's in the basement closet that is so full of crap right now that you can barely get to the valve. Might have to remind the hubby (who put all the crap in there) the importance of having it easily accessible. Haha. Thanks for your supportive comment though, it makes me feel better to know that others have survived floods too and mine is minor compared to the ones I'm hearing about. 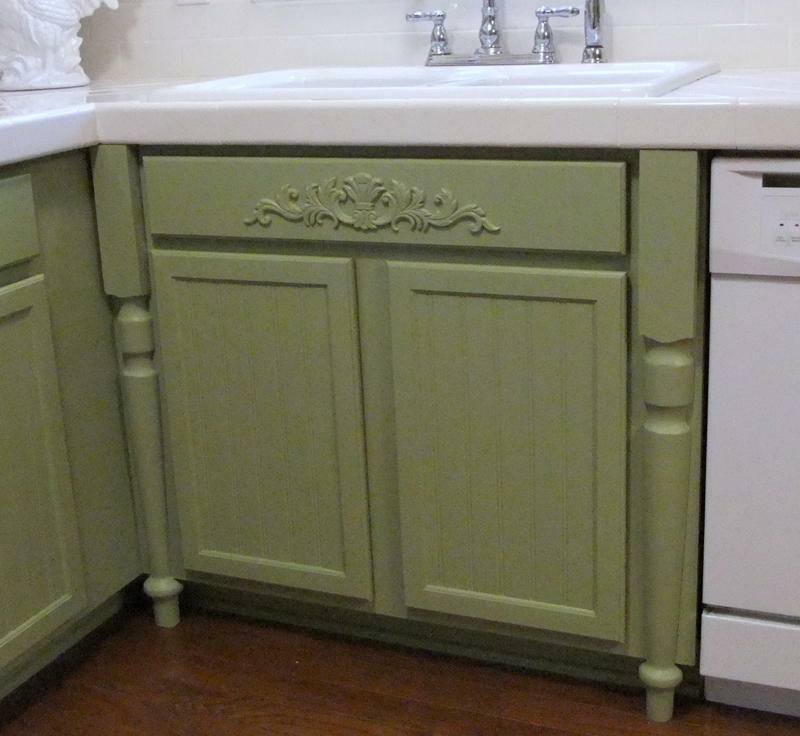 The cabinet paint job is awesome. Wish you lived nearby, I need help with repainting mine!! Girl, I am so glad you found me! I could sit for hours and read your blog. Your kitchen is phenomenal, and I would love to show it off on my blog very soon, if you don't mind. The subway tile spoke to me, as well as everything else in that super fabulous kitchen. 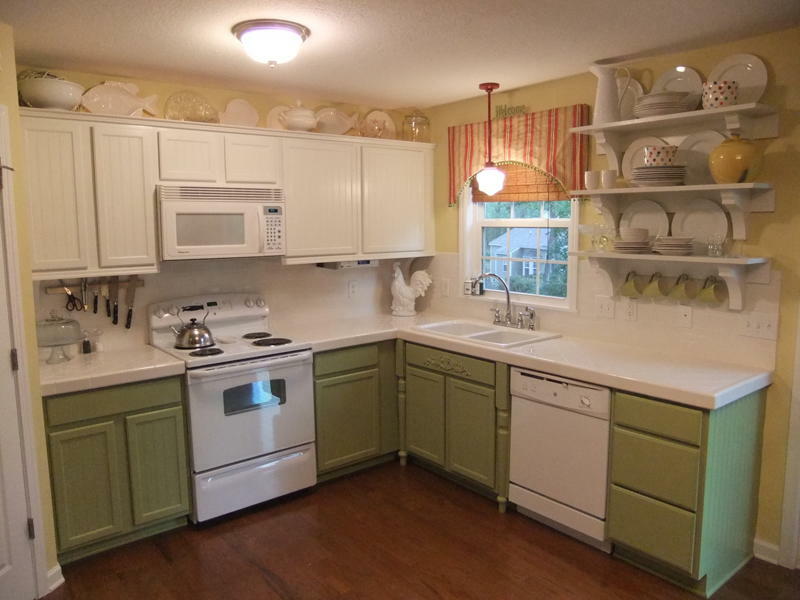 Thank you for choosing two different colors for the cabinets! Not many people have the courage, but it looks SO AWESOME! You picked some of my favorite colors, too. I have already shared you with a few of my friends, cause I dig you like that! I'll stop by again very soon. I will need a few more hours to check out more posts. just stumbled upon your blog and i...love...it!! 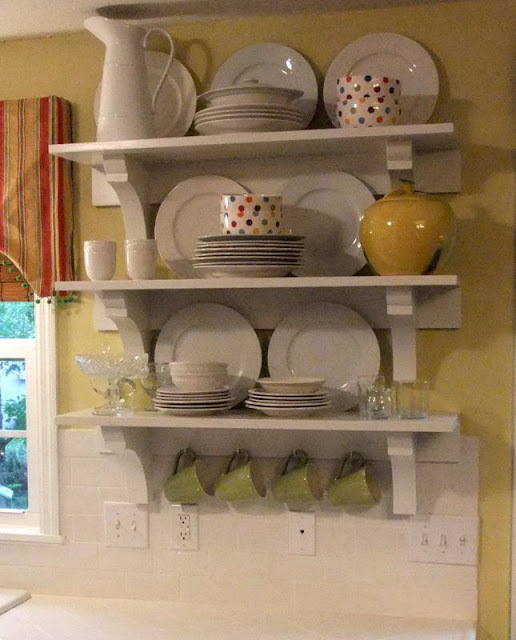 i am starting my kitchen redo this spring and have great ideas thanks to you! keep up the great work! You did a gorgeous job creating a cute and vibrant kitchen. Before was... meh for sure, but it looks beautiful with the details you added under the sink, paint colour choices, and cottage charm throughout!